A celebration of the historic Hundred Guinea Cup race of 75 nautical miles around the Isle of Wight, first instituted in 1851, and shown here in the event held at Cowes in July 2012. The low horizon of this painting puts the spectator at once on a level with the occupants of the yachts, giving an immediacy and sense of participation in the race, as the line is crossed and it begins. 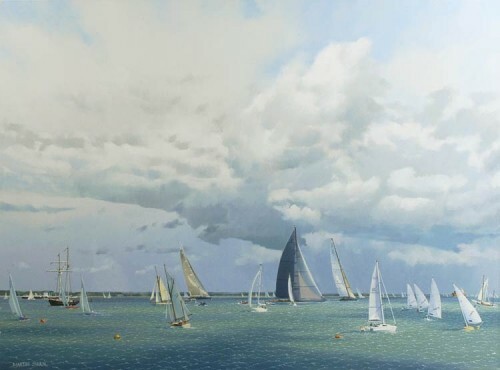 All kinds and sizes of boats skim this tranquil stretch of the Solent, heading east in a search for the wind; the play of their sails and tension between their positions reflect the movement of clouds in the panoramic skies. From left to right, the yachts Velsheda, Lionheart and Ranger can be seen, whilst at rest on the left-hand side an old two-masted sailing ship lends an historic perspective to this great race. The cool colouring gives a freshness and vibrancy to the composition, whilst the stylized, graphic lines which indicate the dinted surface of little waves, make an ironic reference to the tradition of naïve marines in the 18th and 19th centuries. A decorative work, this painting also generates a sense of passing time and hallowed tradition.